The content includes affiliate links. Christmas always sneaks up on me. Once Halloween comes it always feels like Christmas is just around the corner. That’s largely due to the fact that we have TONS of birthdays from now until Christmas so there’s hardly a free weekend. This year I’m going to be ready though. These Peppermint Hot Chocolate Spoons are just the start of my handmade Christmas ideas. As you’ve probably already noticed, I make it a habit of creating food gift ideas for the holidays. 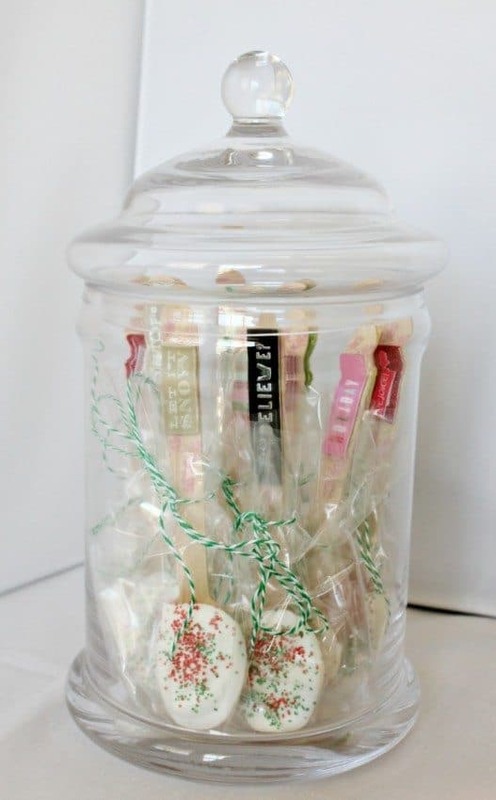 From everything to Mason Jar Peppermint Cupcakes to Rudolf Applesauces, I just love incorporating food into our gifts. This way they’re tasty as well as super cute! 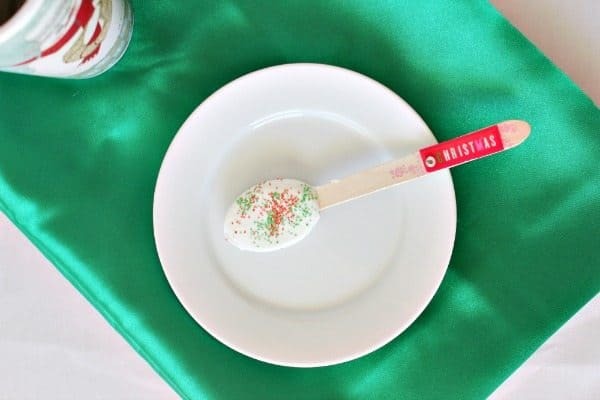 These Peppermint Hot Chocolate Spoons would also make the perfect holiday party favor idea. 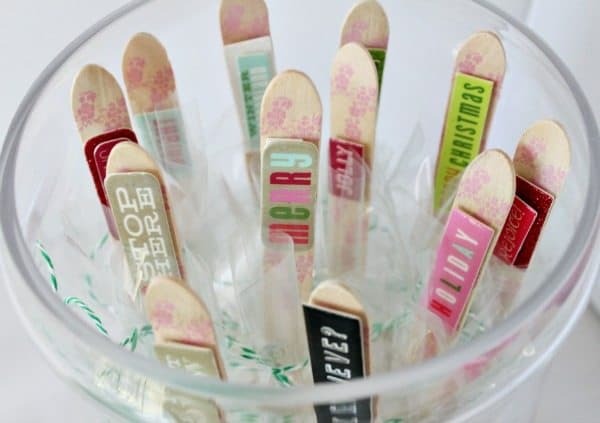 We made sure that each of our guests left with one of these after a fun girls holiday make and take party that featured Young Living Essential Oils. You’ll be blown away by all the ways that you can use essential oils to eliminate harmful chemicals in your home. We trust Young Living Essential Oils to do just that! Just look at all the ways that we have HERE. Peppermint Hot Chocolate Spoons are the perfect fun, gift idea. Melt the Wilton White Chocolate according to package instructions in the microwave. Drop in 2-3 drops of peppermint essential oil and mix well. Dip each of the spoons into the peppermint white chocolate and sprinkle with Christmas color sprinkles. Set on a cooling rack to harden. Package in plastic bags with bakers twine and give as gifts. 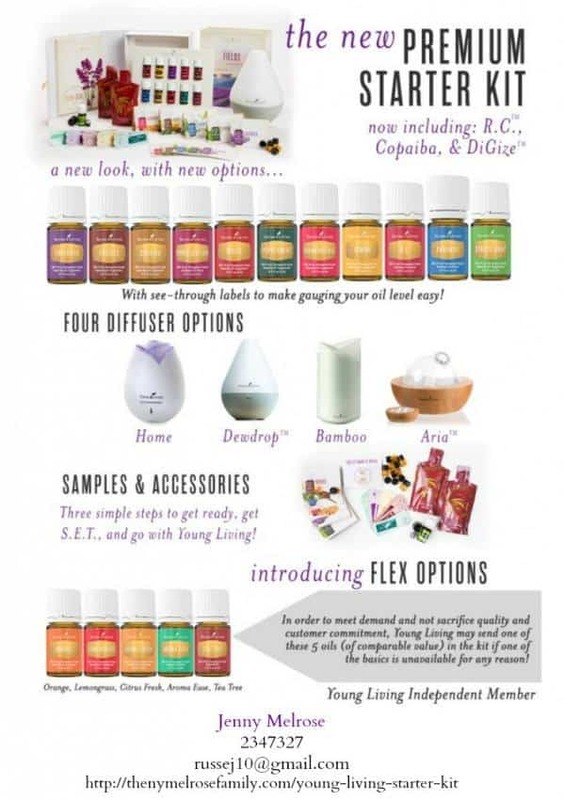 Since we love our Young Living Essential Oils so much we are running an amazing promotion for the month of November. You get all of this plus a bunch of freebies! Click HERE to find out more!